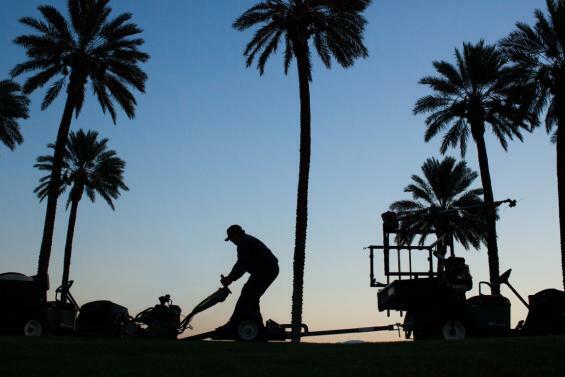 Gabriel Thompson wins the January Sidney Award for The Caretakers, an innovative profile of the Latino immigrants who toil in obscurity to keep the nation’s golf greens manicured. An estimated 180,000 maintenance workers keep the nation’s 15,619 golf courses clean and playable. Two-thirds of these workers are Latino. Course workers rise before dawn to mow turf, rake sand, and dissect weeds out of the sod. It’s highly skilled work that is, by design, all but invisible to the average golfer. They earn about $10 an hour. Thompson experienced some of the demands of the job by working undercover on a course. Oscar, a 70-year-old maintenance worker from Tamaulipas, Mexico, tends a course in Georgia to send money home to his sick wife. They talk every day, but he hasn’t seen her in 20 years. Francisco Mora, 50, works a second job at McDonald’s to support his seven children. Gabriel Thompson has written for publications that include New York Magazine, The Nation, Mother Jones and the New York Times. His most recent book is Working in the Shadows. He is currently working on a biography of Fred Ross—the legendary organizer who trained Cesar Chavez—titled America’s Social Arsonist. Francisco Mora, 50, has spent nearly 20 years as a golf-course maintenance worker in Palm Springs, CA. Most workdays begin at dawn to get ahead of the golfers. Q: This investigation is the latest chapter in a distinguished career spent observing the lives of undocumented people, both as an organizer and a journalist. How did you come to do this work? Mostly by chance. I moved to New York City in 2001 and got a job as a tenant organizer in central Brooklyn. From that work I met so many wonderful people, but these wonderful people were also going through such hell: their children were being lead poisoned, landlords wouldn’t make basic repairs, they didn’t have heat or hot water in the winter. And yet instead of giving up, they were fighting back, and I found their courage exhilarating and inspiring. That’s when I first became close to a number of undocumented immigrants, mostly from southern Mexico. Eventually, while still working as an organizer, I started writing about some of the people, especially this one cab driver from Puebla who had become a key leader in our organization. I left organizing to write a book about him, and ever since have sort of bounced around between organizing and writing, trying to figure out a way to cobble together an income. Amy Goodman has this great line about journalism as “going to where the silence is,” and I think that’s what I most enjoy: trying to tell stories about people who often aren’t included in the conversation. Q: Did you approach Golf Digest about this story, or did they come to you? They approached me. They said that they thought–but weren’t sure–that Latino immigrants played a key role in golf industry, but no one as far as they knew had looked into it. And gave me pretty free reign to explore and report what I found. Q: Golf Digest isn’t known for publishing hard-hitting social justice journalism, what has the reader response been like so far? My experience has been that there’s always a certain percentage of people who send nasty ALL CAPS responses to anything I write about immigration. So I’ve gotten some of that, but it’s to be expected. You know: “I’m going to cancel my subscription,” etc, etc. More interestingly, there have been a fair number of golfers who have emailed me with very positive comments, who felt that the piece allowed them into a world they knew little about, but upon which they were intimately connected. One person even got in touch to try to figure out how they might be able to assist Francisco, the worker I follow in the piece. So overall I’d say the response was heartening. Q: Are you a golf enthusiast? Has reporting this story changed the way you feel about the game? Not at all. Before this story, all I’d played was mini golf during high school. I did play for a couple hours with two friends while working on this piece, just so I would get a feel for it. But it’s not really my sport. I slammed a few clubs into the ground and called it a day. Q: You went undercover on a golf course for a week, doing the grueling work that immigrant groundskeepers do day in and day out. What did you learn from the experience? First, the courses can be huge, and there are any number of emergencies that can pop up during a single shift. And the work is extremely labor intensive. At the course I was at, folks who mow the greens walk eight miles before their lunch break. (As the superintendent told me, “It’ll take weight off anybody.”) It’s also one of those so-called unskilled jobs that require tons of skill and attention to detail, and people take the work very seriously. I eventually learned how to do some of the basic tasks with a minimal level of proficiency, like raking sand bunkers, but my attempt at mowing the greens was a disaster. The other fact that was driven into me while working was that the ideal for a golf course worker is to be completely invisible. They wake up super early–our shift started at 4 am–in order to get the course ready before players arrive. Then, while people are playing, they stay quiet and out of the way. A player can go through their day without once noticing the incredible amount of work that is happening around them, and is for their benefit. Which, of course, is a metaphor of sorts. Q: The golf course industry is supporting a larger guest worker program. Who would benefit from an arrangement like that? It depends. I’ve written previously about how the guest worker program can be exploited, with abusive employers creating conditions that look a lot like slavery. As currently configured, there aren’t very many protections for guest workers, who come to the US and who, if they complain about wages or working conditions, can immediately be sent back. And many people rack up lots of debt to get here, so the threat of being sent home early is quite serious. This isn’t a new problem: one of the first campaigns of Cesar Chavez, before he founded the United Farm Workers, was to challenge the Bracero guest worker program in California. So I think the question, from my perspective, is what sort of guest worker program are we talking about? One with fair wages, strong labor protections, and where employers actually have to prove–instead of just claim–that they couldn’t find workers? Or one that looks like what we have today? Like many employer representatives, the Golf Course Superintendents Association has taken the position in the past that moves to increase protections and wages of guest workers are unnecessary. I take a different view. Q: What would meaningful immigration reform look like? To be meaningful, immigration reform must grant unauthorized immigrants the ability to gain legal status in a relatively short period. That’s it–end of story. It’s so unbelievably complicated now because of all sorts of political calculations: Republicans want to be able to say they didn’t sell out; Democrats feel like they need to prove they are tough. And so the last couple of years have been filled with chatter about beefing up the border, about having more internal security, all these tactics to counterbalance the “gift” we’ll be granting undocumented immigrants by allowing them to legalize their status. But border security has never been tighter, and Obama continues to break new ground with the number of people he deports. There are other aspects, of course. If reform is coupled with a guest worker program, then the program should be altered to give workers real labor and whistleblower protections. But while there are different pieces to a reform package, it’s all relatively meaningless if it doesn’t grant legal status to the millions of undocumented immigrants here, and quickly.